"“I feel that I shall leave life before January 1st. I wish to make known to the Russian people, to Papa (the Tsar), to the Russian Mother (the Tsarina) and to the Children what they must understand. If I am killed by common assassins, and especially by my brothers the Russian peasants, you, the Tsar of Russia, will have nothing to fear for your children, they will reign for hundreds of years. But if I am murdered by boyars, nobles, and if they shed my blood, their hands will remain soiled with my blood for twenty-five years and they will leave Russia. Brothers will kill brothers, and they will kill each other and hate each other, and for twenty-five years there will be no peace in the country. The Tsar of the land of Russia, if you hear the sound of the bell which will tell you that Grigori has been killed, you must know this: if it was your relations who have wrought my death, then none of your children will remain alive for more than two years. And if they do, they will beg for death as they will see the defeat of Russia, see the Antichrist coming, plague, poverty, destroyed churches, and desecrated sanctuaries where everyone is dead. The Russian Tsar, you will be killed by the Russian people and the people will be cursed and will serve as the devil’s weapon killing each other everywhere. Three times for 25 years they will destroy the Russian people and the orthodox faith and the Russian land will die. I shall be killed. I am no longer among the living. Pray, pray, be strong, and think of your blessed family. ”". 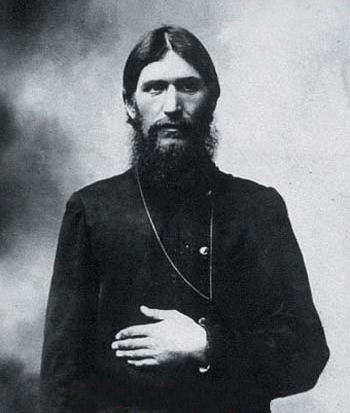 Grigori Efimovich Rasputin (January 10th/23rd 1869 – December 17th/30th, 1916), a peasant born in Pokrovskoye selo of the Tobolsk Area, faith healer and pilgrim. For many years Rasputin travelled and visited orthodox monasteries and holy places, coming back home for each sowing and harvesting season. During one of his trips in 1906 Rasputin was introduced to the Tsar’s family and became their close friend. He was a simple religious Russian man. See also Grigori Rasputin “Zhitiye Opytnogo Strannika” (“Life of a Pilgrim”), see also Grigori Rasputin “Moi Mysli i Razmushleniya” (“My thoughts and Reflections”). Since 1910 an organized campaign was started against Rasputin in press. He was accused of horse-stealing, belonging to the Khlysty sect, unrestricted sexual life and alcoholism. None of these accusations were proven upon investigation but libel did not stop. The documents published recently show that the campaign was arranged by freemasons to discredit the Tsar. See also Tatyana Mironova “Grigori Rasputin: Obolgannaya Zhizn, Obolgannaya Smert” (“Grigori Rasputin: Life in Lies, Death in Lies”). All attacks, libel and lies targeted at Rasputin were in fact intended against the Tsar which stood for the Fatherland and Russian state. Having found the most sensitive and intimate subject in the life of the Tsar’s family, the enemies of the Tsar and Russia attacked it methodically and skillfully as they once did with John of Kronstadt who was a close friend of Alexander III. See also Oleg Platonov “Zhizn za Tsarya (Pravda o Grigorii Rasputine) (“Life for the Tsar (Truth about Grigori Rasputin)”). “Who needed this?” asked “Moskovskiye Vedomosty” and gave the answer. “He was only the means by which they wanted to discredit, compromise and criticize our time and our life. His name was used to label Russia”. The doctor of the Tsar's family E.S. Botkin said: “If there were no Rasputin, the opponents of the Tsar’s family and revolutionists would attack Vurybova. If there were no Vurybova, they would attack me or someone else”. Rasputin’s murder was arranged by freemasons under the leadership of V.A. Maklakov to shatter the spirits of the Tsar and the Tsarina. Prior to the revolution in December 1916 the holy man was lured to the house of freemason Felix Yusupov and brutally murdered. After the power was seized by the Provisional Government consisting primarily of freemasons, Rasputin’s body was desecrated and then burnt by the order of A.F. Kerensky. See also Sergey Fomin “Ikh Pepel – v Nashikh Serdtsakh (Ritualinuy Kharakter Ubiystva Grigoriya Rasputina) (“Their ashes – in Our Hearts (Ritual Murder of Grigori Rasputin)”). ”".